The Perfect Saint Patrick's Office Dress. A couple of weeks ago we had like 5-6 days when our temperatures went from early 50s to mid 60s, and we got our first touches of Spring. Of course that didn't last because not only did the temps drop as low as 20 degrees, but we got snow again. That is Michigan. 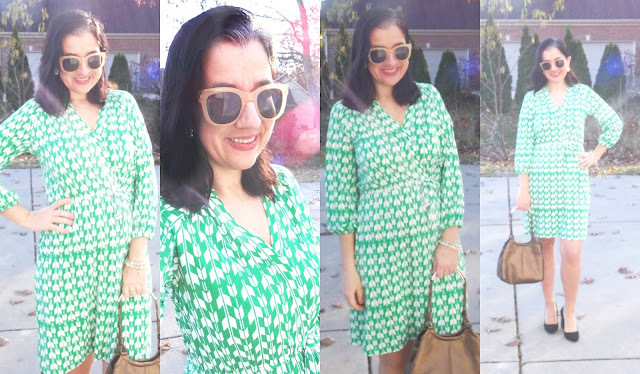 But with that said, I was able to wear this Beautiful Wrap-Style Green Shirtdress to work (with bare legs) one of those warm days. And it is perfect for me to blog it now because next week is Saint Patrick's day. You will notice on these photos, a touch of the sunset. It was pink and red and totally beautiful. The photos were shot in the afternoon after I got out of work. Some of these pics are a little dark and I apologize but I had to share this outfit nevertheless, because I believe this is The Perfect Saint Patrick's Office Dress. I do believe this Green Dress is perfect to wear next week in honor of Saint Patrick's day. 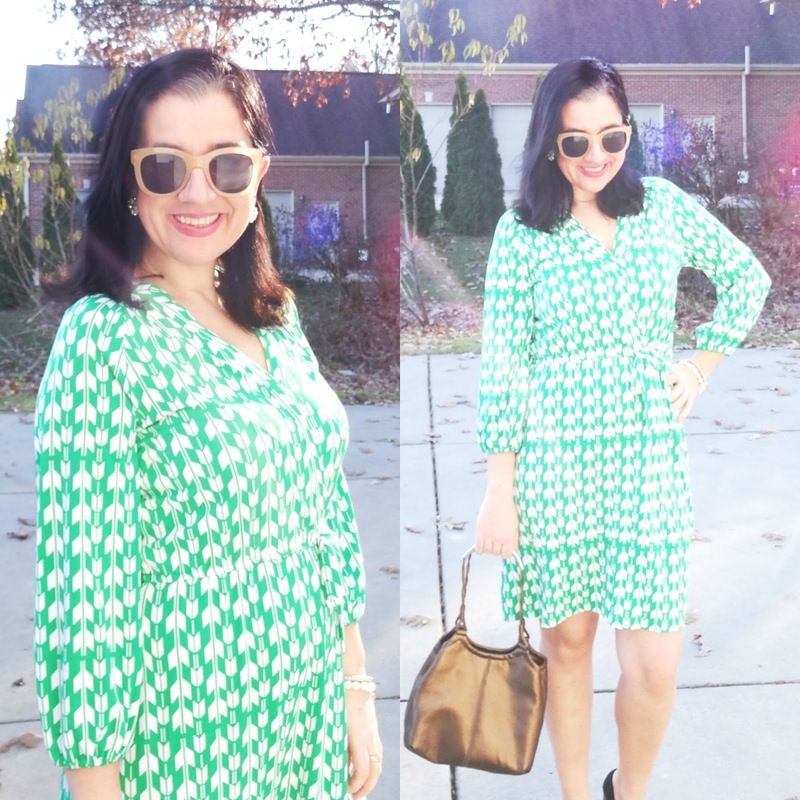 The Bright Kelly Green Color is perfect and so flattering I think, on any woman. I love the Chevron Pattern Mixing the green with the white. It is a Pullover type of dress with the faux wrap style on the waist where the drawstring creates even more of a waist and a slimmer silhouette. Even better, it is the softest, wrinkle-free jersey material and this beautiful dress was gifted to me courtesy of a local boutique. I kept this dress simple and classic with my Black, Block-Heel Tortoise Pumps, some Matching Green+Silver Large Flower Stud Earrings and a Bronze Handbag which matched those tortoise heels quite nicely.